DEAL EXPIRED: Apple authorized reseller B&H Photo this week is knocking $200 off Apple's current 13-inch MacBook Pro in Space Gray. This model, priced at $1,099.00 , is equipped with a 2.3GHz processor, 8GB of memory and a 128GB SSD. In addition to the instant savings, B&H Photo will not collect sales tax on orders shipped outside NY and NJ* , making this deal $75 to $200 cheaper compared to other Apple authorized resellers — and $300 cheaper on average for many shoppers compared to buying from the Apple Store. Expedited shipping is also free to the contiguous U.S. for speedy delivery to your doorstep. DEALS EXPIRED: Adorama this week is knocking $100 to $275 off every Mid 2017 15-inch MacBook Pro with Touch Bar. Many configurations are eligible for a $50 to $100 off exclusive coupon code APINSIDER using the pricing links in this post on top of instant discounts (look for the * below). These systems also qualify for free shipping — and the Apple authorized reseller will not collect sales tax on orders shipped outside NY and NJ. For many shoppers outside those two states, this equates to $290 to $455 in savings compared to paying full price with tax at the Apple Store. See how these deals stack up in our 15-inch MacBook Pro Price Guide. Please note, the prices shown below are after any coupon and/or instant discounts. DEAL EXPIRED: Apple authorized reseller Adorama is slashing prices on Late 2015 27-inch iMac 5K inventory exclusively for AppleInsider readers. Save up to $1,050 in combined instant and coupon savings with promo code APINSIDER. In addition to the lowest prices ever, Adorama will not collect sales tax on orders shipped outside New York and New Jersey, potentially saving many shoppers another $135 to $160. Shipping to the contiguous U.S. is also free, and Adorama is even offering no interest when paid in full within 12 months when you sign up for the Adorama Credit Card. DEAL EXPIRED: Apple authorized reseller B&H Photo is knocking $450 off Apple's Mid 2017 13-inch MacBook Pro with Touch Bar exclusively for AppleInsider readers. The premium configuration in Space Gray is packed with upgrades, including the line's fastest 3.5GHz processor and 16GB of memory. 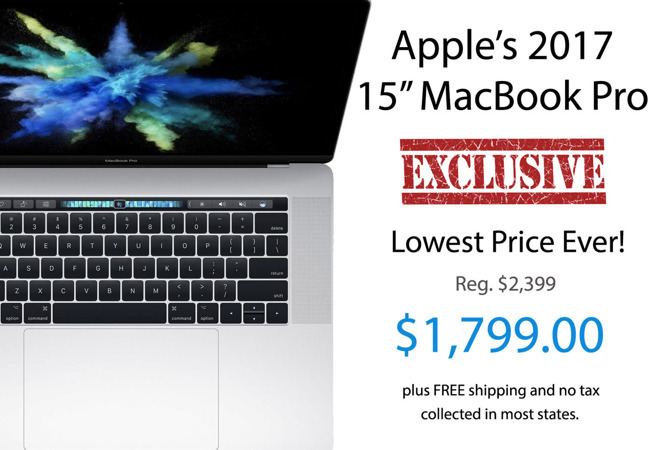 Now $1,849.00 after the exclusive discount, this deal offers shoppers the absolute lowest price available from an Apple authorized reseller by $430, according to our 13-inch MacBook Pro with Touch Bar Price Guide . 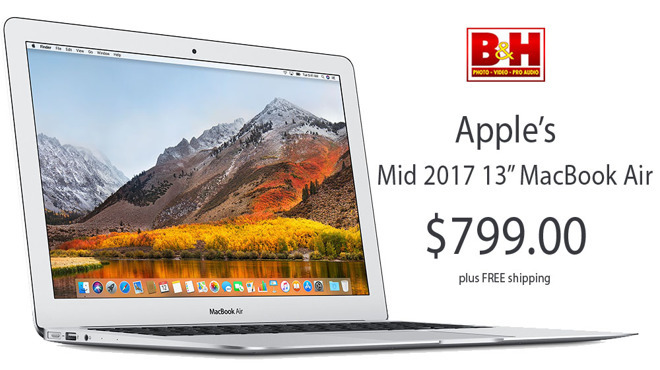 Along with the cash savings, B&H will not collect sales tax on orders shipped outside NY and NJ, and expedited shipping is free within the contiguous U.S.
DEAL EXPIRED: Available only at AppleInsider, Apple authorized reseller B&H Photo has just slashed the price of Apple's Mid 2017 15-inch MacBook Pro to $1,799.00 . This $600 instant discount represents the lowest price we've ever seen on the Silver configuration , which features a 2.8GHz quad-core Intel Core i7 processor, 16GB of memory, 256GB of storage and Radeon 555 graphics. In addition to the exclusive markdown, B&H will not collect sales tax on orders shipped outside New York and New Jersey, saving many shoppers outside those two states another $145 on average, and expedited shipping is free within the contiguous U.S. In what is the absolute lowest price available, B&H Photo has Apple's Mid 2017 27-inch iMac 5K marked down to $1,499.00 , a discount of $300 off MSRP . This is the best deal we've seen to date on the standard configuration, which features a 3.4GHz Intel Core i5 quad-core processor, 8GB of DDR4 RAM, a 1TB Fusion Drive and AMD Radeon Pro 570 graphics. According to our 27-inch iMac 5K Price Guide , other Apple authorized resellers are charging at least $150 more for the same configuration. Offer ends at 11:59 p.m. Eastern on Aug. 27. 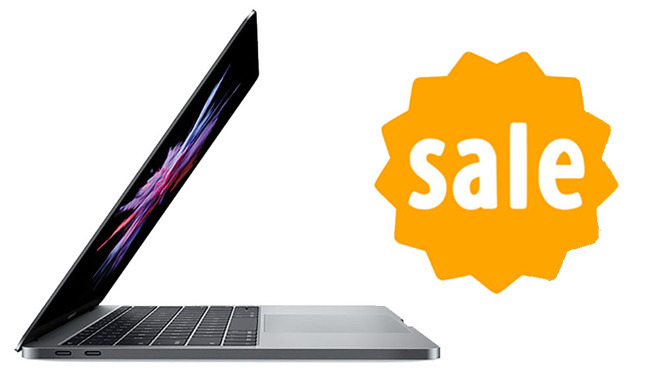 DEAL EXPIRED: B&H Photo this week is knocking $100 to $200 off every new 2018 13-inch MacBook Pro with Touch Bar. 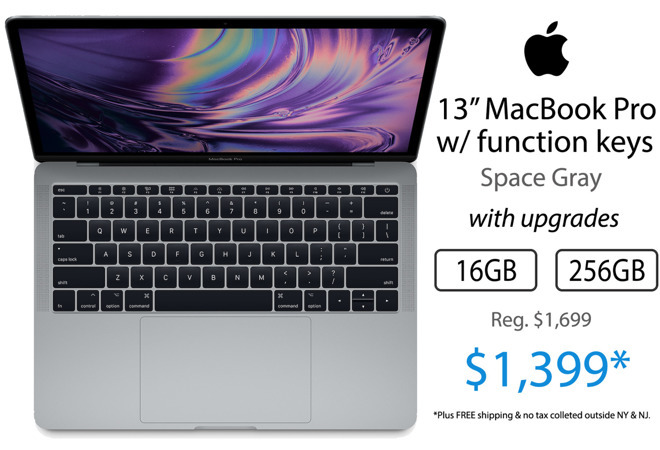 With prices starting at $1,599.00 for the quad-core models, these deals offer shoppers aggressive discounts according to our 2018 13-inch MacBook Pro with Touch Bar Price Guide . On top of the cash savings, B&H will not collect sales tax on orders shipped outside NY and NJ, and shipping is free. DEAL EXPIRED: B&H Photo this week is knocking $100 to $200 off Apple's current 13-inch MacBook Air. These Mid 2017 models not only qualify for free expedited shipping to the lower 48, but B&H will not collect sales tax on orders shipped outside NY & NJ* . In fact, according to our 13-inch MacBook Air Price Guide, the models linked below ring in $50 to $130 cheaper compared to other Apple authorized resellers. 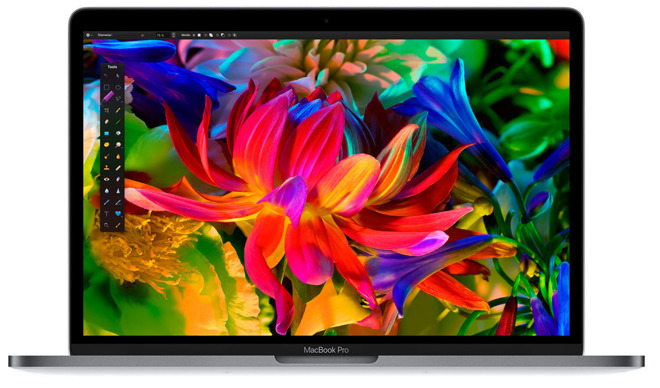 DEAL EXPIRED: In what is the absolute lowest price we've ever seen, B&H Photo is knocking $300 off Apple's upgraded 13-inch MacBook Pro with 16GB of memory and a 256GB SSD. Now $1,399.00 for the popular configuration using the step-by-step instructions below, this deal rings in $200 cheaper than other Apple authorized resellers, according to our 13-inch MacBook Pro Price Guide . It's also $500 cheaper than a 2018 model with the same amount of memory and storage. 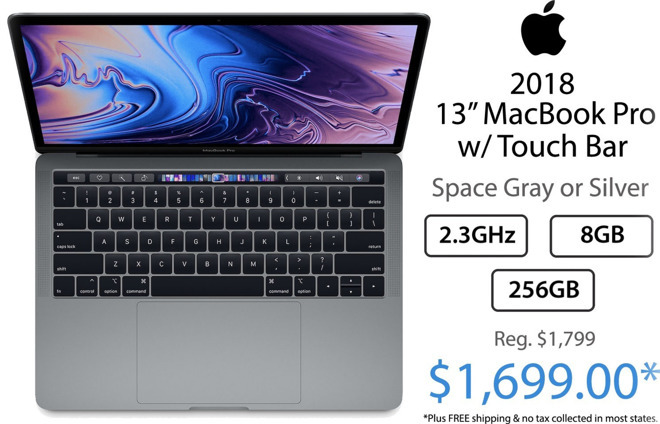 DEAL EXPIRED: Apple's brand-new 2018 13-inch MacBook Pro is here, and shoppers can save $100 on the Touch Bar model featuring a quad-core 2.3GHz processor, 8GB of memory and 256GB of storage space when you shop at B&H with our exclusive pricing links. 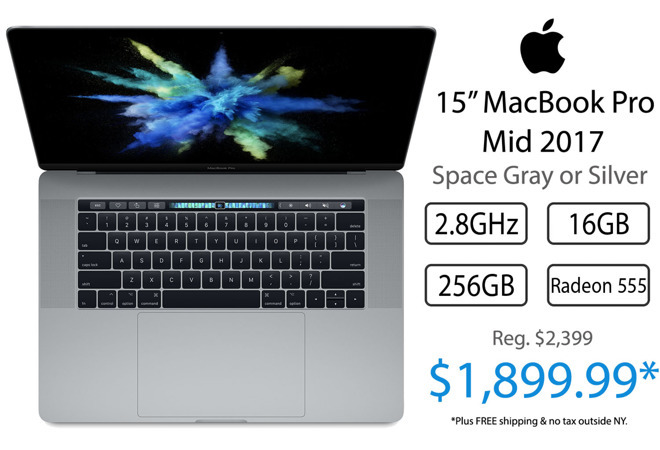 Now $1,699.00 in your choice of Space Gray or Silver, this deal rings in at least $25 cheaper compared to other Apple authorized resellers, according to our 2018 13-inch MacBook Pro with Touch Bar Price Guide . DEAL EXPIRED: Exclusively for AI readers, RAVPower with Amazon is knocking $30 off the RAVPower 26800mAh 30W Output USB-C PD Power Bank, bringing the price down to $51.99 with promo code AIRAV058. This is the lowest price available on the portable charger with USB-C support. This offer expires on Sept. 3. DEAL EXPIRED: Apple authorized reseller B&H this week is knocking $200 off Apple's current 13-inch MacBook Pro in your choice of Space Gray or Silver . This model, priced at $1,099.00 with the pricing links in this post, is equipped with a 2.3GHz processor, 8GB of memory and a 128GB SSD. In addition to the instant savings, B&H Photo will not collect sales tax on orders shipped outside NY and NJ* , making this deal $75 to $200 cheaper compared to other Apple authorized resellers — and $300 cheaper on average for many shoppers compared to buying from the Apple Store. Expedited shipping is also free to the contiguous U.S. for speedy delivery to your doorstep. DEAL EXPIRED: Apple authorized reseller B&H Photo just launched a promotion offering shoppers a free gift card with the purchase of a qualifying 2018 13-inch or 15-inch MacBook Pro with Touch Bar . In addition to the free e-gift card, B&H will not collect sales tax on orders shipped outside NY and NJ* , potentially saving many shoppers $140 to $230 compared to buying from Apple. Expedited shipping is also free for fast delivery to your doorstep. 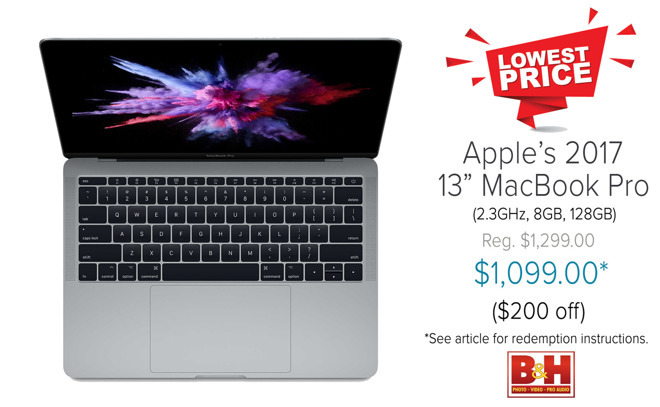 DEAL EXPIRED: Apple authorized reseller B&H Photo this week is knocking $100 off the standard Mid 2017 13-inch MacBook Pro without Touch Bar. This configuration in Silver features a 2.3GHz processor, 8GB of memory and 128GB of SSD storage. Now $1,199.00 after the instant discount, this machine also comes with free expedited shipping to the contiguous U.S. for fast delivery to your doorstep. B&H also will not collect sales tax on orders shipped outside NY and NJ. According to B&H, supply is limited at the reduced price, so don't delay. 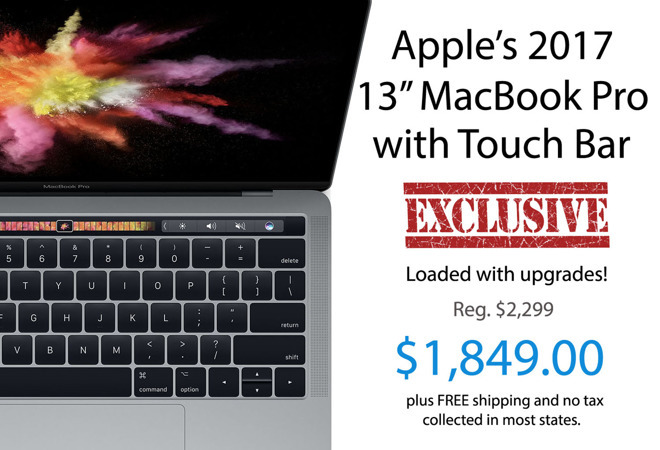 Apple authorized resellers Adorama and B&H Photo are currently accepting pre-orders for the new 2018 13-inch MacBook Pro with Touch Bar with no tax collected outside New York and New Jersey (see here for details). For many shoppers, this can equate to $140 to $295 in savings on the 13-inch models with quad-core processors compared to buying from Apple directly. These are the exact same systems carried by the Apple Store and include Apple's standard 1-year limited warranty. DEALS EXPIRED: Apple authorized reseller B&H is clearing out remaining Late 2016 15-inch MacBook Pro inventory with discounts of $800 to $1,600 off upgraded models. Pick up a Radeon 460 system with 512GB of storage for $2,099.00 after an $800 instant rebate. Or opt for a top-of-the-line 2.9GHz, Radeon 460 config with 2TB of storage for $2,699.00 with the pricing link in this post ($1,600 off MSRP). These deals also include free shipping to the contiguous U.S. — and B&H will not collect sales tax on orders shipped outside NY and NJ (CO and VT residents, see here ). SOLD OUT: Highly rated eBay seller dealsfellow has Apple's current 15-inch MacBook Pro for just $1,899.99 this week, the lowest price we've seen to date on the standard model. This configuration in your choice of Silver or Space Gray features a 2.8GHz quad-core processor, 256GB of storage and Radeon 555 graphics. These systems are brand-new and factory sealed, exactly like you would receive from the Apple Store — only $500 cheaper. Shipping is also free, and Dealsfellow will not collect sales tax on orders shipped outside NY. 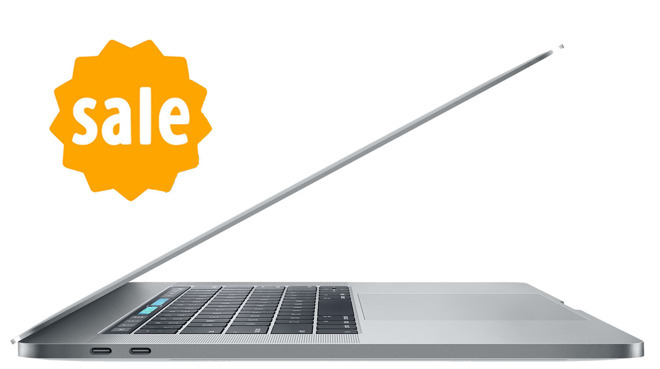 SOLD OUT: Today only, eBay seller dealsfellow is offering readers the lowest price ever on Apple's current 13-inch MacBook Pro with Touch Bar. Featuring a 3.1GHz processor, 8GB of RAM and a 256GB SSD in your choice of Silver or Space Gray, these systems are just $1,299.99 with coupon code PERFECTDAY. This equates to a discount of $500 off MSRP. What's more, dealsfellow will not collect sales tax on orders shipped outside NY, and shipping is free. Offer ends 9 p.m. Pacific on June 29. DEAL EXPIRED: Ringing in as the lowest price available from an Apple authorized reseller, according to our Headphones Price Guide , Adorama is offering AI readers an exclusive $24 discount on Apple AirPods with coupon code APINSIDER, bringing the price down to $135.00. This deal is in addition to free shipping and no tax collected on orders shipped outside New York and New Jersey, making the exclusive price $37 cheaper on average compared to buying from the Apple Store, Verizon, AT&T, etc. Offer ends at 11:59 p.m. Eastern on June 30. DEAL EXPIRED: For a limited time only, HomePods are getting an exclusive $20 discount at Apple authorized reseller Adorama. Now $329.00 with the special pricing links in this post and coupon code APINSIDER, this discount offers shoppers the lowest price available from an authorized reseller, according to our Smart Speaker Price Guide . What's more, Adorama will not collect sales tax on orders shipped outside New York and New Jersey, potentially saving shoppers another $30 on average. This special offer ends June 30. DEALS EXPIRED: Shoppers can save hundreds on Apple's current 15-inch MacBook Pro equipped with upgraded storage and graphics at Adorama this week. From Radeon 560 models for just $2,449.00 to tricked out systems with 3.1GHz processors and 1TB of storage for $2,999.00 , there are a variety of configurations marked down at Adorama this week with promo code APINSIDER. In fact, with combined coupon and instant savings, shoppers can save $300 to $400 on Mid 2017 systems only at AppleInsider. 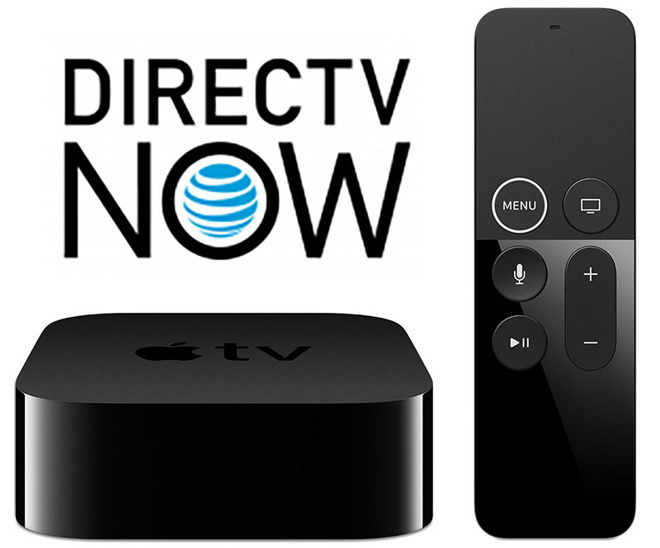 DEAL EXPIRED: DirecTV's popular Apple TV 4K promotion is back, and for a limited time new DirecTV Now subscribers can get a 32GB Apple TV 4K for free when you prepay for just three months of service. Prices for DirecTV Now plans start at $35 per month, allowing users to get both service and the Apple TV 4K for as low as $105. Factor in the Apple TV 4K's value of $179 and shoppers can save $74 without even factoring in the streaming content. DEAL EXPIRED: Apple authorized reseller Adorama is heavily discounting the Apple TV 4K exclusively for AI readers. Save $30 with promo code APINSIDER on the 32GB model, bringing the price down to $149.00 . Shipping is also free to the contiguous U.S. with no sales tax on orders shipped outside New York and New Jersey. For many shoppers, this equates to $45 in savings compared to buying the same device from the Apple Store. This deal also beats other Apple authorized resellers by $20 to $30, according to our Apple TV 4K Price Guide . DEAL EXPIRED: B&H is bringing back the popular cash rebate on the 2018 iPad, bringing the price down to $299.00 for the 32GB model in Space Gray. This $30 instant discount on the Wi-Fi tablet is in addition to free shipping to the contiguous U.S. for easy delivery to your doorstep. And unlike other big box retailers, B&H Photo will not collect sales tax on orders shipped outside New York and New Jersey (Colorado and Vermont residents, see here ), saving many shoppers over $50 compared to buying from the Apple Store. DEALS EXPIRED: For 36 hours only, B&H Photo is knocking $30 off 2018 Wi-Fi iPads with prices starting at $299 . 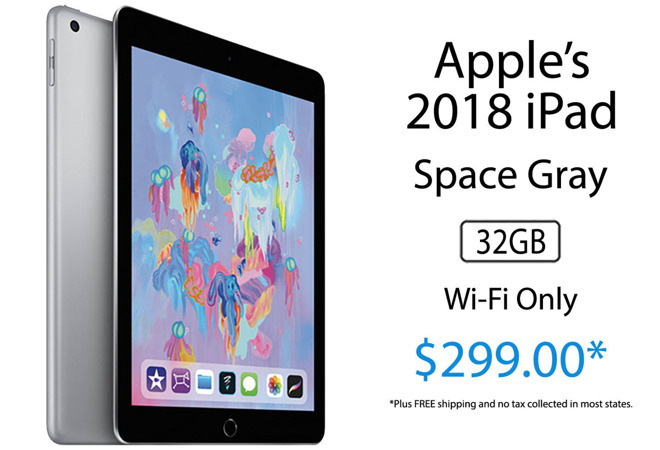 This $30 instant discount on the 32GB Wi-Fi model in your choice of Silver, Space Gray or Gold is in addition to free expedited shipping to the contiguous U.S. for fast delivery to your doorstep. And unlike other big box retailers, B&H Photo will not collect sales tax on orders shipped outside New York and New Jersey (Colorado and Vermont residents, see here ), saving many shoppers over $50 compared to buying from the Apple Store. SOLD OUT: Adorama this week is knocking $850 off the upgraded Late 2015 27-inch iMac 5K equipped with a 3.3GHz processor, 8GB of memory, 2TB Fusion Drive and premium M395 graphics. 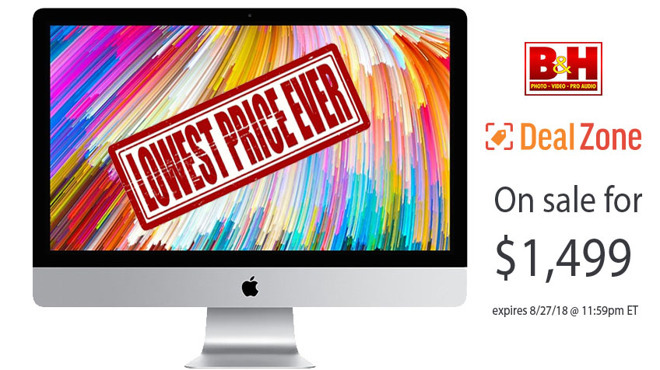 Now just $1,449.00 thanks to $50 off coupon code APINSIDER and a $800 instant rebate, this deal offers shoppers the lowest price available, according to our 27-inch iMac 5K Price Guide. What's more, Adorama is tacking on free shipping to the contiguous U.S. with no sales tax on orders shipped outside NY and NJ, potentially saving many shoppers another $100+. To compare the price difference between this model and a 2017 iMac 5K , you would need to spend another $500 to get 2TB of storage. DEALS EXPIRED: Apple authorized reseller B&H Photo is offering AI readers an exclusive $200 discount off MSRP on Apple's current Mid 2017 13-inch MacBook Pro. This model, which is equipped with a 2.3GHz processor, 8GB of RAM, and a 128GB SSD, is now $1,099.00 when activated using the instructions below. According to our 13-inch MacBook Pro Price Guide , this deal provides shoppers with the lowest online price available from an Apple authorized reseller by $100 to $200. B&H is also tacking on free expedited shipping to the contiguous U.S., and the Apple authorized reseller will not collect sales tax on orders shipped outside NY and NJ (CO and VT residents, see here ). SOLD OUT: Adorama just slashed the price of Apple's Late 2015 21-inch iMac with a 1.6GHz processor, 8GB of RAM and a 1TB HDD to $749.00 this week. To compare this deal to other retailers, third-party sellers on Amazon are selling the same config for $935.00 or more , making this offer $185+ cheaper than other resellers. Factor in no sales tax on orders shipped outside New York and New Jersey, and many shoppers can save another $60 on top of the instant savings. DEALS EXPIRED: Adorama this week is offering AppleInsider readers exclusive coupon savings on top of instant cash discounts on Mid 2017 12-inch MacBooks with promo code APINSIDER. 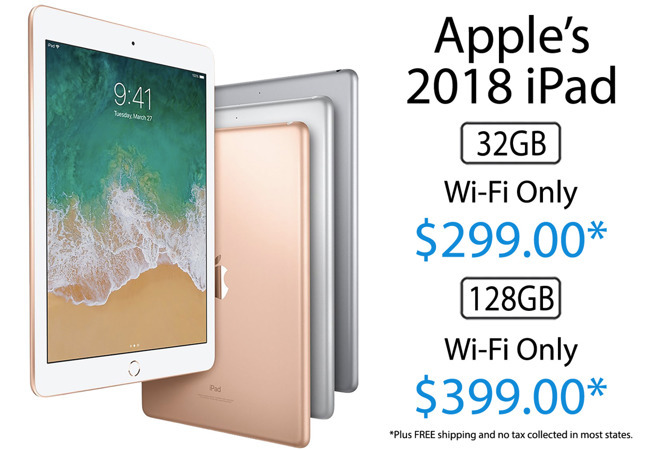 From the standard model for $1,194.00 in Gold (thanks to an $85 instant rebate and $20 off code APINSIDER), to an upgraded model with a faster 1.3GHz processor and 512GB of storage space for $1,379.00 with the same code, both deals offer shoppers the lowest prices available, according to our 12-inch MacBook Price Guide. What's more, Adorama will not collect sales tax on orders shipped outside NY and NJ, saving many shoppers $200 to $240 compared to buying from the Apple Store. Shipping is also free to the contiguous U.S. — and if you're looking to finance the purchase, each 2017 12-inch MacBook also qualifies for no interest if paid in full within 12 months using the Adorama Credit Card. Adorama is clearing out remaining Late 2016 15-inch MacBook Pro inventory this week with exceptional savings for AI readers. Save $1,100 to $1,200 on the premium models, making these the lowest prices we've ever seen on the upgraded configs. What's more, Adorama will not collect sales tax outside NY and NJ, which for many shoppers equates to another $150 to $175 in savings.